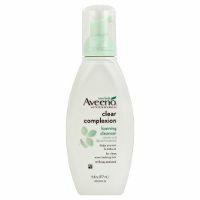 You don't have to let a blemish or two ruin your day when you have the Clear Complexion Foaming Cleanser from Aveeno. This mild-formula cleanser works on the trouble spots while leaving your skin feeling smooth and soft. This cleanser is gentle enough for everyday use on normal to sensitive skin and leaves your face feeling soft and smooth.